The iconic Philippine Jeepney continues to evolve. Before WWII, there was the Jitney. This was a sedan that retained the driver’s cab but the back was converted to a somewhat flatbed pick-up truck style with a roof. The rear seated 6 with the seats facing each other. 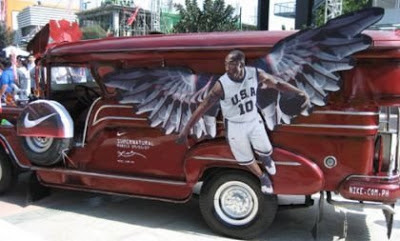 This was the progenitor of the jeepney. After the war, many of the Jeeps (from GP or General Purpose vehicles) were left by the GIs who came home without many of their equipment. In Operation Magic Carpet where 6 million American GIs were sent home after the war, it was too expensive to bring back the equipment and therefore the Jeeps were left behind. The war ravaged country had its transport infrastructure destroyed. The Tranvias or electric car railway system did not survive the battles, many of the motor transport were commandeered by the Japanese and in turn were also destroyed in the fighting. The left over jeeps were then converted by the Filipinos and pressed into service as public transports. At first, these were only the same 6-seaters like the Jitney but the demand for transport grew as urban migration increased because of the need for more manpower for the post-war reconstruction. The Jeepney was modified with more powerful surplus engines and turned into 10-seaters eventually. The high point of this design was the diesel-powered 18-seater Jeepneys that is found today. The drawback is that no new innovation came aside from the cosmetic changes in the outside appearance, mind-blowing stereo and lights system and efforts in introducing air-conditioning in some units that never really attained feasibility. The current jeepney is still powered by surplus Japanese diesel engines that emitted too much smoke and contributed to the problem of air pollution not only in urban areas but also increasing in the rural locations were transport is also needed not only for humans but also for produce from the agricultural sector. There was a need to redesign the jeepney and another step in evolution was needed. There have been efforts to introduce more environmentally-friendly jeepneys before. 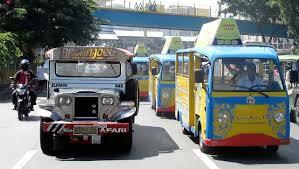 The first serious effort was in Makati in 2008 when E-Jeepneys were tested by the local government. These were supposed to service the Ayala route. The test was a failure since the E-Jeepneys used 16 battery banks and were too heavy themselves. Because the battery banks used were ordinary lead-acid automotive batteries, they did not have enough power to travel on inclines such as rolling terrain, bridges and flyovers and utilization time which was supposed to be 8 hours a day were not met. 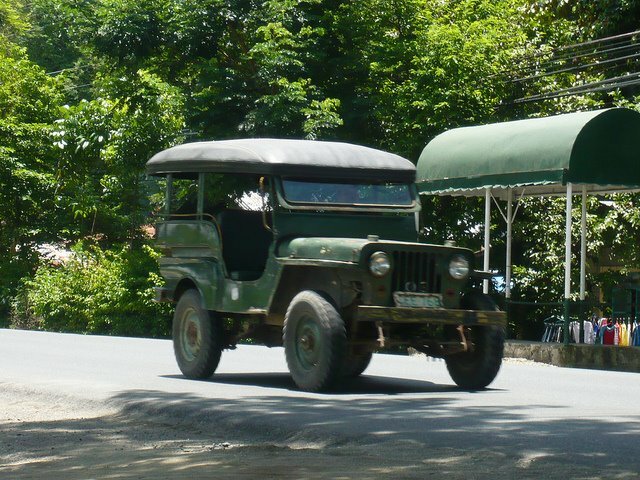 Serrotma Enterprises joined the fray in the same year when it introduced E-Jeepneys that had lithium-ion deep cycle batteries that offered more endurance, longer battery life and can negotiate steep inclines with ease. Also, charging time for the batteries were 8 hours that equated with a maximum range of 85 kilometers. These were even used for the Ms. Earth motorcade in 2008 and escorted by electric motorcycles. The drawback was that there are no recharging stations akin to gas stations in the infrastructure. Also, the speed limit for electric vehicles was pegged at 45 KPH as per regulations of the Land Transportation Office (LTO). There were no investments for these and the result was that the E-Jeepney and E-Tricycle projects were shelved. But the need for another evolutionary step was still necessary. The BEEP has energy-efficient engines that meet European standards in vehicle emissions with a grade of 0.58 to 1.74 relative to the standard passing mark of 2.5. The BEEP is a 24-seater vehicle that can service up to a maximum of 600 passengers a day depending on the route it services. Conventional jeepneys only have the capacity for half of that number. The Development Bank of the Philippines (DBP) also has its Boundary Hulog Program version 2.0. since last October 5, 2016. DBP officially turned over the BEEPs or Bagong Jeeps to new operators under an initiative by Kilusan sa Pagbabago ng Industriya ng Transportasyon (KAPIT) and 1-Transport Equipment Aggregator and Management Inc. (1-TEAM). Each BEEP unit costs between Php1.0 million to Php1.5 million and is under a DBP loan program payable with a maximum term of 7 years. Having undergone tests since 2014, the BEEPs will come equipped with GPS tracking devices and CCTV Cameras. Also, an Automated Payment System will be introduced that will utilize BEEP Cards like the ones being used in LRT and MRT. Aside from the driver, the BEEPs will have a “passenger assistance officer” on board that will facilitate the payments. The minimum fare is set at 7 pesos. There is also a projected internet based Fleet Management System that will enable the operators to manage their BEEP Fleet real time and it includes monitoring. 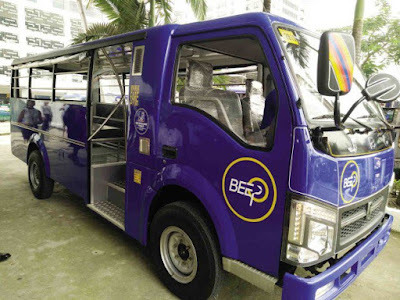 BEEP is also the test bed for the image refurbishing of jeepney drivers. The drivers will be required to pass medical, psychological and drug-testing before being certified to drive the BEEPs. There will also be weekly seminars to be attended with operators weekly. Currently there are 3 BEEPs servicing the Manila-Marikina route and 3 in the Quezon City-Manila route. It is expected that before the end of 2016, there will be 1,000 new BEEPs and in 3 years, 10,000 units will have been fielded nationwide.